World of Warcraft Gold Guide - How To Make Gold in WOW: Fastest way to make gold yet! Here's another easy and quick way to make gold. 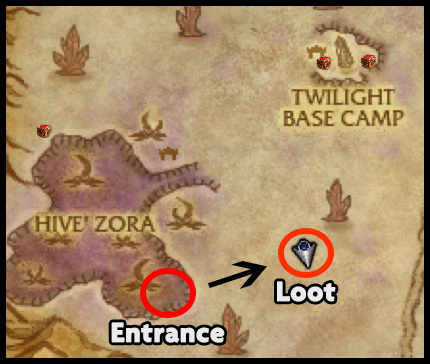 It takes less than a minute, and if you are lucky, you can find loot worth tens of thousands of wow gold! Your level also doesn't have to be high (40+ recommended). What kind of treasures await you? Log in, loot, log out! This gold making method is very simple. 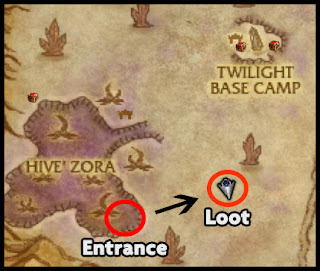 All you have to do is go to Silithus (Fastest way here is to take the portal to Uldum from your capital), and find the entrance to Hive'Zora at coordinates 34,59 or at the location marked in the map below. After running through the maze to the very end, you'll usually always find a treasure chest and a rare monster. Enter the bug maze, and follow it to the back room. Treasure chests in high end vanilla zones can drop the most valuable loot from my experience, such as Orbs of Deception, which I have sold many for more than 100k gold each. And the rare monster drops a green item always, which can sell nicely, if it looks nice, or is otherwise a rare drop. To know an item's value easily, use the addon LootAppraiser. The place is hidden well, and there's no other reason to go there. So you should always find at least the rare spawn called Losaj there. However, there seems to be limitations on how many treasure chests can be up in a map at a time, which should be no more than 4. So if there's no chest up here, it's a good idea to check the other chest locations on the map, as it usually means the chest has spawned elsewhere. 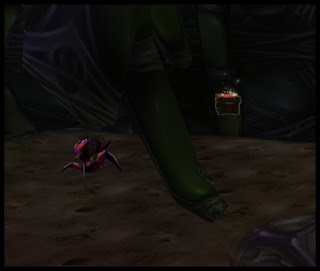 But other chests are significantly easier to find, as most of them spawn above ground. This place is however so hidden and inaccessible to most classes, that when a chest spawns here, it won't be looted in a long time. It usually takes a few hours for a chest to respawn, and it can spawn anywhere in the zone, if there's no other chest closeby. So there's no reason to log onto your toon too often. Rares also respawn usually in from 30 minutes to a several hours. you'll have to improvise to get to it! One important thing you must know! The treasure chest in this place is bugged, and spawns in the air (Like many other chests in different zones). This means it's impossible to reach, unless you can jump higher, like with a Demon Hunter, or have an another ability to reach an otherwise unreachable spot, like Grappling Hook. Rogue is great also because Outlaw specialization allows you to track treasure chests on minimap, which makes farming them so much faster, as you can then tell if it's worth it to go into an annoying cave to check for treasure! Sadly vanilla rares don't appear on the minimap, unlike other rares do. To see all possible chest spawns, download the addon gathermate2 and it's gathermate2_data. Then import spawn data from gathermate2_data, and go to the addon's settings to make sure treasure chest spawn points are shown on the map. Thanks for sharing the post on World of Warcraft which is incredibly the fun game to be played online. Buy World of Warcraft Accounts from Accountwarehouse who provides the accounts for sale at the best price.